This cake took the blue ribbon at the Illinois State Fair in 2009, and it isn't hard to see why once you've tasted a bite. 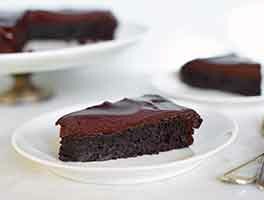 The combination of chocolate and cocoa flavor is perfectly balanced, and the coconut milk in the cake gives it a moist, fudgy texture. Jone Shumacher's invention is one of our favorites, too. 60 mins. to 1 hrs 20 mins. 26 mins. to 28 mins. 1 hrs 26 mins. to 1 hrs 28 mins. To make the cake: Preheat the oven to 350°F. Grease and flour three 9" round cake pans, line them with parchment, and grease the parchment. 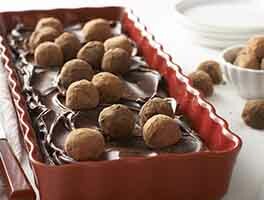 In a large bowl, using an electric mixer, beat the butter, sugar, and cooled chocolate together. Add the eggs one at a time, and beat until the mixture is fluffy. Combine the milks, vanilla, and coconut flavor in a large measuring cup. Add the dry and wet ingredients to the butter mixture in thirds, alternating between them until all are incorporated. Stop the mixer, scrape the sides and bottom of the bowl, and beat for 1 minute more, to be sure the batter is evenly mixed. Divide the batter evenly among the prepared pans, leveling the tops with an offset spatula. Bake the layers for 26 to 28 minutes, until the center springs back when lightly touched, and a tester inserted in the center comes out clean. Remove from the oven and cool in the pans on a rack for 10 minutes, then remove the layers from the pans and return to the rack to finish cooling completely. To make the filling: Blend the shortening or shortening and butter with the coconut milk powder or flour. Add the coconut flavor, vanilla, and coconut milk, and mix until combined. Mix in the salt, then half the confectioners' sugar, until well blended. Mix in the marshmallow creme, then the remaining confectioners' sugar. 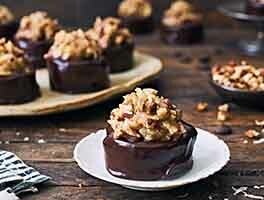 To make the frosting: Mix the butter and cooled chocolate together; beat in 1 cup of the confectioners' sugar. Mix in the vanilla, coconut flavor, and salt, then add the remaining confectioners' sugar 1 cup at a time, adjusting the consistency with unsweetened coconut milk as necessary, until you have a spreadable consistency. Trim any domes off the cake layers to make them flat, if necessary. Line a serving plate with strips of parchment or waxed paper, and place one layer, top down, on top. Spread with half the coconut filling. Place another layer over the filling, top down, and spread with the remaining coconut filling. Place the third layer on top. 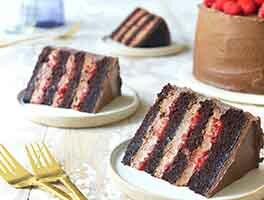 Cover the top and sides of the cake with a thin layer of chocolate frosting. Place the cake in the refrigerator for 30 minutes to firm up this crumb coat. Finish the cake with the remaining frosting. Garnish the top with some shaved or shredded coconut (or coconut flakes), if desired. Jone's original recipe called for packages of pre-melted liquid chocolate; which is fine to use if you have it on hand. We've called for unsweetened chocolate to be melted and cooled. 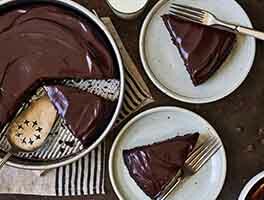 There's no difference in the way it will perform in the cake, but if you're using melted unsweetened chocolate for the frosting, you'll need more milk or cream to adjust its consistency. The total weight of the batter for the cake layers is 3 pounds, 1 ounce. If you have a scale, it's easy to make all your layers the same size. Simply put the pan on your scale, tare it to zero, and add batter until it reads 1 pound and a fraction of an ounce. Never try to frost a cake that's still warm! The layers will slide around, and the frosting will run. Refrigerate (or freeze) the layers after taking them out of the pan if you're pressed for time. Frosting a cake in two stages is the secret to a professional-looking cake. The first, thin layer of frosting (the crumb coat) seals in any crumbs, and when refrigerated to firm up, provides a stable base for you to work on as you do the final, finished frosting and decorating. This cake was a big hit with my family and I definitely will make it again. I didn't think , as some reviewers said, that it was too sweet. It's no sweeter than most cakes and certainly less sweet than most commercially made cakes. What a perfect balance of the coconut and chocolate flavors. For the coconut flavoring, my local supermarket had a 'coconut paste' from Australia that was really like a gel than a paste. I'm probably a less experienced baker than most people on this website and had never baked a 3 layer cake before. (I didn't even think in advance that the pans wouldn't fit in the oven). I wasn't sure what to do so I baked them on 2 racks, carefully watching and testing them for doneness. . Later I saw on a website that some people put the third pan over the other two. In your recipe directions, I think it would help if you mention that. Should you use a paddle or whisk for the mixer for the cake batter? What about the frosting? I have made the cake but haven't tasted all together. Components tasted good though. I only used 3 cups of confectioners sugar in the frosting instead of 5 or 6. 5c-6 seemed like alot and I saw comments from other bakers that it was very sweet. This cake came out perfect. I pre-ordered all the ingredients and put the cake together this morning. Looks just like the picture on this recipe. The reason I did not give it 5 stars is only because I am not a chocolate cake fan. But it does taste very good. I made this cake the day before Easter, to serve after dinner on Easter Sunday. It did take a tiny bit longer to make, but it was well worth it. This cake is AWESOME!!! Some reviewers said this it was way too sweet, but we didn't think so. Yes, it's sweet, but it's a cake. It's SUPPOSED to be sweet! We thought it was just perfect. The cake layers are moist and delicious, the coconut cream filling is out of this world and the frosting is fantastic! Next time I make this, I plan to scatter some unsweetened coconut on top. This is now our favorite cake and I plan to make it again and again! Thank you, Jone, for sharing this wonderful recipe with KAF! And thank you, KAF, for sharing this recipe with all of us! WE LOVE THIS CAKE!!! It did take some time to build but it was worth it, well worth it. I reduced the sugar in the cake and the filling, worked out just fine. This cake is seriously good, wonderfully moist. I wills say that I tried it with several different coconut extracts, some were rather expensive and fancy-pants, often more than doubling the recommended amount. In the end the King Arthur's vanilla extract was the most flavorful with only the recommended about. This is our new favorite Birthday Cake recipe. I thought the recipe looked interesting, but it is way better than I could have imagined. I could go on and on, but the other reviews sum it all up very well. Different, delicous, and a "titch" decadent. Who could ask for more?? Life is good. Beyond too sweet. This was pretty terrible. Both the filling and the frosting were tooth achingly sweet. The cake was decent, but there's no special reason to bake 3 separate layers. It would have been much less trouble to bake two thicker cakes and then slice them in half. This was a big disappointment. 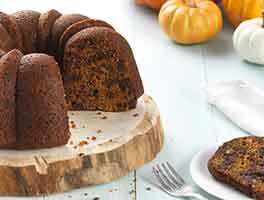 This cake is absolutely fabulous--the whole thing is very unique and special and not too sweet at all in our opinion, for what isn't to like about fudgy, creamy frosting made with powdered sugar? This cake didn't last long at our house the first time I made it...Then I made cupcakes the second time and used my pastry bag to insert the filling in the middle of the cupcakes, then just frosted them to get the whole desired taste with the filling in the middle. Since I didn't use up all the filling, after frosting them I piped a filling star on each one to decorate them a little more. The cupcakes were the first dessert gone at the recent neighborhood BBQ and they were raving about them. One thing I would mention, I tried and didn't like using the lite version of coconut milk in trying to cut out some of the fat, but hey, I think in this cake use the full fat version if you can as I thought the whole thing was much better with the regular coconut milk...happy baking! Though this took a little time to prepare it was well worth it. I made it for a birthday. Someone at the party said it was better than anything he bought at bakeries. Keep thes recipies coming!